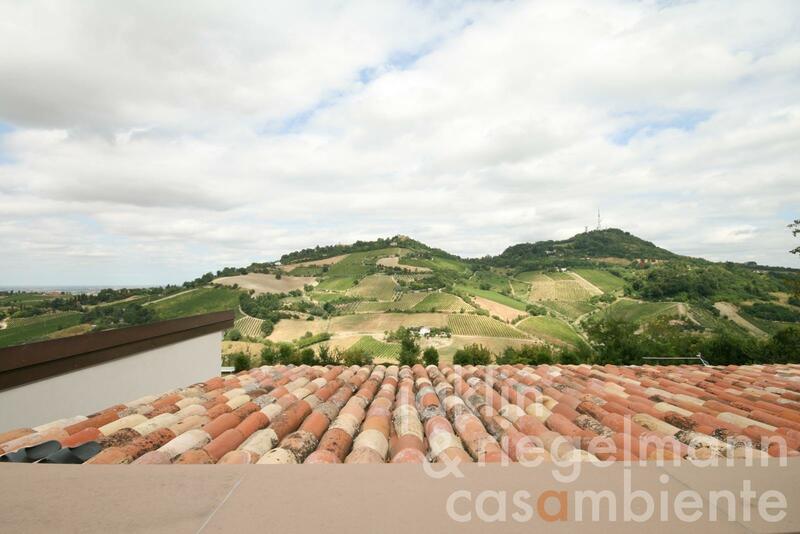 Established and well-run Italian winery for sale in panoramic setting in the rolling hills above Forlì-Cesena with views until Ravenna and the Adriatic Sea. The winery is managed by an experienced winemaking family in the third generation, who aims for the highest quality in its products. The property comprises about 5 hectares of vineyards, several buildings and a swimming pool. All buildings have been built recently and were just completed. The main house offers about 300 m² of living area in the owner's apartment and an area for guests of about 70 m². The annexe of about 100 m² features a tasting area on the ground floor and a separate apartment on the upper floor. The ground floor in the main house is characterised by generous circumferential porticos and offers an eat-in kitchen, a large living room, studio, and a bathroom. The first floor is composed of two bedrooms, two bathrooms and a large roof terrace. The main house overlooks the beautiful surrounding landscape and the newly built swimming pool. The guest area is divided into two independent suites. The three separate guests units in total could also be run as an Agriturismo. The plot around the buildings measures about 7,600 m² and can be turned into a garden or park. In addition to the about 5 hectares of own vineyards the owners have leased further 5 hectares. About one fourth of the estate's production is currently turned into own wine, the rest of the grapes are sold to neighbouring winemakers. The estate's wines have received several awards and are well-known and much sought-after in upscale gastronomy, amongst others. The grape varieties are Sangiovese, Sangiovese Grosso, Chardonnay and Albana. The winemaking is currently done in a leased cellar close by, which houses the winery's equipment and machinery. An own wine cellar can be built. If desired, the owners are available for advice and support during the transition period. 5.81 ha with about 5 hectares of own vineyards. Electricity, photovoltaic modules, mains water, central heating, solar thermal system, underfloor heating, air conditioning, gas tank, telephone, broadband internet access, satellite-TV, swimming pool, roof-deck, private parking, terrace, vineyard, garden.